Toshiba has finally revealed the date and pricing of their upcoming “world’s thinnest 10-inch tablet,” the Toshiba Excite 10 LE. The Toshiba Excite 10 LE tablet is a super-thin 10.1-inch tablet that comes with 16GB ($530) or 32GB ($600) of onboard storage. It has a 10.1-inch display, is 0.3 inches (7.7 mm) thick and weighs 1.18 pounds (535 grams). 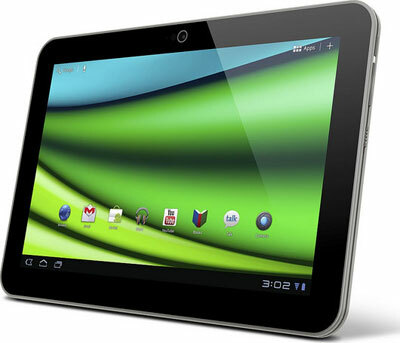 By comparison, Samsung’s Galaxy Tab 2, which also has a 10.1-inch display, is 0.38 inches thick and weighs 1.3 pounds. Apple’s iPad 2, which has a 9.7-inch screen, is 0.34 inches thick and weighs 1.33 pounds. IRVINE, Calif.–(BUSINESS WIRE)–Toshiba’s Digital Products Division (DPD), a division of Toshiba America Information Systems, Inc., today announced that the Excite™ 10 LE tablet will be available for purchase from select U.S. retailers on March 6. Previously introduced as the Excite X10, the Excite 10 LE is the world’s thinnest and lightest 10-inch tablet measuring just 0.3 inches (7.7mm) thin and weighing just 1.18 pounds (535g). The Excite 10 LE tablet, powered by Android™, carries a starting price of $529.99 MSRP2 for the 16GB model and $599.99 MSRP for the 32GB model. The thin and light Excite 10 LE features a vivid high-resolution 10.1-inch diagonal AutoBrite™ display3, delivering optimum browsing, reading and entertainment. Designed for durability and style, the device also features a high-quality magnesium alloy surface and scratch-resistant Corning® Gorilla® Glass display with an anti-smudge coating for greater resiliency. The tablet also comes with an array of connectivity interfaces and ports on board, including micro-USB and HDMI® ports, a micro-SD slot to share content and files with other devices, plus Wi-Fi® and Bluetooth® connectivity. Stereo speakers with exclusive sound enhancements by Toshiba and SRS® Labs deliver superior audio capabilities. Front and back HD cameras provide convenient photo capture, plus 1080p video recording and video chatting. Powered by the 1.2GHz Texas Instruments OMAP™ 4430 multicore mobile processor4 and dual-channel memory, the Excite 10 LE offers smooth web browsing and multitasking plus the performance for high definition video and entertainment. Extremely power efficient, the Excite 10 LE delivers up to 8 hours of battery life. The Excite 10 LE tablet features Android 3.2, Honeycomb, and will be upgraded to Android 4.0, Ice Cream Sandwich later this Spring. Also included is a full suite of familiar Google™ Mobile Service applications, including the Android Market™, YouTube™, Gmail™, Google Maps™, Music, Videos. Additionally, the tablet comes pre-loaded with a mix of Toshiba software and third-party applications including TOSHIBA App Place, TOSHIBA Book Place, TOSHIBA Media Player, TOSHIBA File Manager as well Netflix™ and Zinio™. Toshiba will also offer a suite of tablet accessories for the Excite 10 LE, including a docking station, multiple cases and more.